The subject of the October (7th) session is quite a simple one I think, thought it may be hard for some people. Anyway I want people to pick a large brewery or corporation that owns a lot of breweries. There are many to chose from. Give thanks to them for something they have done. Maybe they produce a beer you do actually like. Maybe they do great things for the cause of beer in general even if their beer is bland and tasteless but enjoyed by millions every day. I can think of two right away that I would like to thank (don't feel the need to limit yourself to one). If you can't think of any well then here is one quick one. Diageo and Arthur's Day. At the very least, this is a worldwide celebration of beer. It may be Guinness* orientated but anything that gets people drinking beer and not alcopops is a good thing in my book. If you honestly have nothing good to say about a large brewer, then make something up. Some satire might be nice, It will be a Friday after all. So remember, October 7th is a celebration of our big mega breweries for the work that they do. Post your contributions here as a comment, or email them to me. *I'm quite fond of the black stuff when there is nothing more interesting going. I certainly enjoy a pint of a well made beer that is quite flavoursome compared to many a pale lager. Good man. I'll try to think of something. BTW the notion that St. Arthur's day "may be Guinness* orientated" is the understatement of the em, week maybe, for me anyway. Adding a definition of "big boy" might make it more incendiary, but it could also help. Because of consolidation this has become a much shorter list. Mine's up. Thanks for hosting, and for supplying the beers I wrote about. Hey Reuben, here's my maiden post http://wp.me/p1J04Z-2Z (sorry not sure how to post a link). I'll try that again after simple html 101. There's my post. Thanks for hosting! Cheers for hosting. Good to see more Session involvement on this side of pond. Been AWOL for a while but we are back for Session 56. Our post is up, you can find it here. Thanks for hosting and posing an interesting topic. Here's a post for your Session. It's a pleasure to be contributing again. I believe my post will fall into the "satire" category. Most of it. Yes, certainly. Right, thanks. 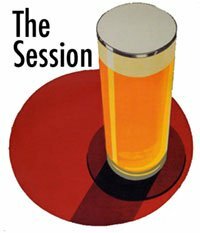 Session post for the Brew Site is here. Here's my contribution, thanks again for hosting. The Tale Of The Ale: Announcing the 56th Session hosted by me.